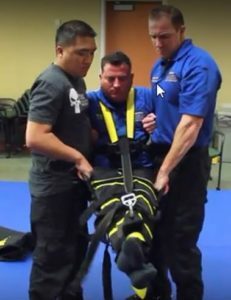 New ICE restraining device as it appeared on “Orange is the New Black,” as featured on the website of the device’s manufacturer, Safe Restraints, Inc. Image: Safe Restraints video screengrab. Immigration & Customs Enforcement (ICE) Air Operations has ordered 60 “Wrap” restraint devices — full-body restraints that resemble straitjackets — for the purpose of restraining detainees during removal operations, according to federal procurement documents reviewed by TYT. DEMONSTRATION OF THE WRAP. IMAGE: SAFERESTRAINTS.COM. It comes as no surprise that detainees facing deportation would be in an agitated state: Since Trump’s immigration policies took effect, there have been numerous cases of migrants who committed suicide after being separated from their families. Reports also suggest that many deportees face a return to life-threatening environments, such as domestic abuse or gang violence. Many deportees may qualify for refugee or asylum status; however, the US government has been slow to process asylum requests — in some cases simply declining to hear them. Aside from facing dangers in their home countries, migrants have also been detained by ICE at facilities with histories of abuse allegations, as TYT previously reported. At one such facility in 2002, a 15-year-old girl died from asphyxia after being restrained by staff members. The county medical examiner ruled her death a homicide. The Wrap reportedly has been implicated in multiple fatalities, but no liability has been established in court and its maker, Safe Restraints, Inc., of California, maintains that no deaths or injuries have resulted from its use. An Arkansas juvenile facility reportedly was told to stop using The Wrap after officials found it was deployed as punishment rather than solely for safety purposes. EXCERPT FROM GOVERNMENT PRICE LISTINGS FOR THE WRAP. IMAGE: GSAADVANTAGE.GOV. On September 18, 2017, ICE’s Office of Training and Tactical Programs published an updated Authorized Restraints Device Guidelines, in which the Wrap became the only authorized soft restraint device. The company says hundreds of police and other local agencies use the device, as well.